So here it is the BOOSTY maybe the best way to boost your broadband speeds. 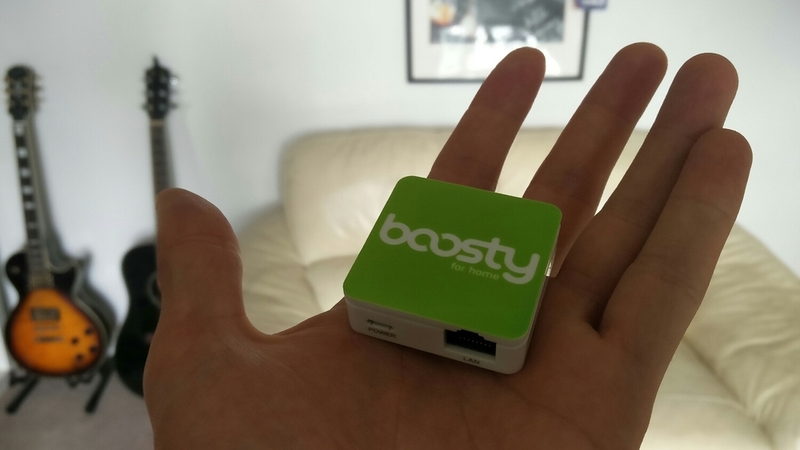 This interesting little device 'The Boosty' tethers to your modem and combines your mobile phones 3G/4G with your cripplingly slow broadband...to deliver a more stable and faster internet connection. However you should bare in mind that you may have limitations on your mobile data. So if you decide to try one of these out, should be sure to set a data limit cap. The boosty retails at around £69 and can be bought directly from Boosty.com . Stay tuned to WhatGear.net for an exclusive interview with Paul the creator of the Boosty in the very near future. If you enjoyed this video make sure you hit SUBSCRIBE for more like this in the future. So as Xmas comes closer you might be in need of some gift ideas. I have to say this is an old video so some of these gift ideas may have exploded and been removed from market. Others still seem like a cool gift to me. Check out some WhatGear gifts ideas, looking for inspiration for Xmas gifts?...look no further. Also if you have the time check out my Xperia M4 Aqua unboxing and camera test review.